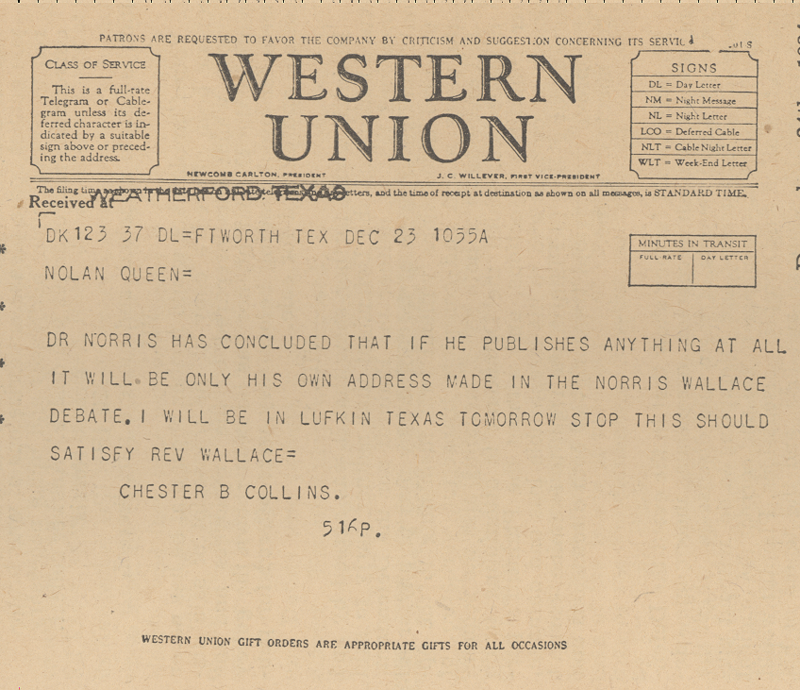 With reference to the Norris-Wallace debate, this is to advise you that there will not be any publication and distribution of this debate until after Dr. Norris returns to Fort Worth, and at least until December 24th, 1934. Attorney for Dr. J. Frank Norris. In line with our conversation on yesterday I am passing over the hearing at Dallas set for today until Dr. Norris returns with the hope that after you consult and advise with him you will consider it advisable that the participants get together and iron out their difficulties. In the event that cannot be done we can then surely agree upon a date for a hearing on the courts order. Trusting that with your cooperation we shall be able to get these men together without further trouble or delay and thanking you for the courtesies extended. Nolan Queen Attorney for Foy E. Wallace, Jr.
December the Twentieth, Ninteen Hundred Thirty Four. Thanks for the letter from Norris. He now expresses the same desires, apparently, as Mr. Collins, that is that we should be able to get together in a conference and adjust the matter to the satisfaction of all. stated that he was going to advise Norris that a conference be held immediately after his return to see if we could not get together. I am inclined to the view that you are a good man to talk with Norris and if such a conference should be arranged I would certainly desire that you be there with bells on. I am sure that Norris will get in communication you upon his return but I trust we will not have the conference until after Christmas day if possible. Mr. Collins will be gone during X-mas also. I believe that since they see we mean business an agreement can be made to our mutual satisfaction. Soon after receiving your telegram Dr. Norris was kind enough to call me over the telephone advising me the same as was in your telegram. Now I suggest that Dr. Norris give me a statement to the effect that no publication of any kind will be made of any part of said debate and of the oral discussions of Mr. Wallace, and I will present this statement to the Court together with my motion for dismissal of our Application for an Injunction. When this is done I shall feel that the matter has been closed. I have written Dr. Norris as to the effect as stated herein, and am sure I shall receive his statement in writing forthwith. of any part of said debate. We understand this to mean that there will be absolutely no publication of any part of said debate for the reason that Wallace has never been permitted to examine the transcript of same. that there will be no publication or attempt at publication or sale of any part of Wallace arguments and oral discussions by you and him. With this statement from you I can then present the same to the Court, and dismiss our application for permanent injunction which will as far as we are concerned terminate this controversy. I have just returned from Ft. Worth, and can now assure you that there will be no publication or attempt at publication of the Norris-Wallace debate. As soon as I get this Agreement in proper legal form I shall submit it to the Federal Judge with my motion for Abatement. This is to advise you that there will be no publication or attempt at publication of the Norris-Wallace debate. As soon as I get this Agreement in proper legal form I shall submit it to the Federal Judge at Dallas with my motion for Plea and Abatement. I have talked with Dr. Norris, and have communications from him, but not quite sufficient. This I am sure will close the matter as Mr. Norris advises me that he does not wish to be held in contempt of the United States District Court. Pursuant our telephone conversation, and in answer to yours of the 24th, this is to state that I will not publish Rev. Wallace's addresses in the debate, but will publish my address only. Since Dr. Norris has advised you that he is not going to publish Mr. Wallace's part of this debate, I would like for you to dismiss this suit, as it cannot serve any useful purpose by long remaining on the docket. I have just received your letter of the 19th, and have been planning to run over to Dallas, and file a motion for dismissal of this cause. I have received oral and written assurances from Dr. Norris that there will be no publication in any way or manner of Mr. Wallace's part of the discussions, and suppose that the proper way to dispose of same will be obtain an Order of Dismissal. I think the better plan would have been to enter the Judgment making permanent the restraining order, but since Dr. Norris was never served with the order this seems to be the next best step. I shall therefore at the earliest possible moment run over to Dallas, present my motion for dismissal, and have an Order prepared for same, but shall of course discuss the matter with Judge Atwell to see if this meets with his approval. I should have attended to this much sooner, but have permitted the matter to be neglected because of the press of other things. Judge Atwell advises me that the Order dismissing the Wallace-Norris matter has been signed and forwarded to the Clerk at Fort Worth. Of course this was done because of the statement of Dr. Norris that no publication would be made of any of the material used by Wallace in the discussions and with that in view I trust that this will finally dispose of this matter because it has been a source of a great deal of trouble to us. With very kind personal regards, and trusting that I may have the pleasure of meeting you.